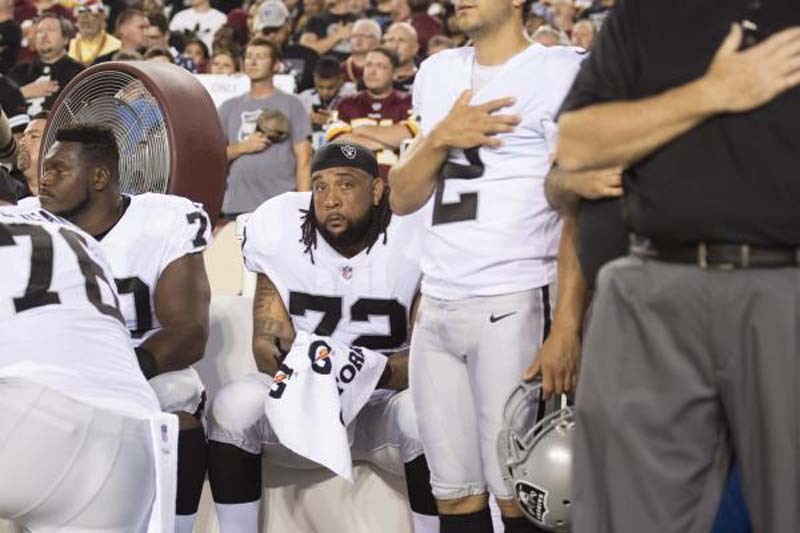 Donald Penn revealed that he was fit to be tied when the Oakland Raiders selected fellow offensive tackle Kolton Miller with the 15th overall pick of the 2018 NFL Draft. Penn, in fact, was so upset that he called Raiders head coach Jon Gruden to share his displeasure. "I'm not going to lie, as soon as I saw the draft pick, I called Gruden immediately. Like 'Man, what the [expletive],'" the 35-year-old Penn said during an appearance on Michael Rapoport's podcast, via SilverandBlackPride.com. "He didn't answer, but when I saw him the next Monday, he was joking with me saying, 'You were ready to kick my [expletive], huh, Donald! You were mad as a [expletive].'" Gruden said the selection had nothing to do with Penn, who signed a two-year, $21 million contract extension after holding out during training camp last year. "Donald has been a very good player for the Raiders, a guy that I coached in Tampa, know extremely well, but this has nothing to do with Donald Penn," Gruden said. "This is about the future of the Oakland Raiders, we have an outstanding young quarterback, we have a need at the position, and we're very fortunate to address it, but it doesn't really say anything to Donald Penn." Penn, who is entering his 13th NFL season, knows that the team has to address the future -- and he plans to help it along with both Miller and fellow offensive tackle Brandon Parker, who was a third-round selection by the Raiders. "I'm going to try and get those young guys right and take them under my wing," Penn said. "So when I am done, I want to make sure this first-round pick gets all my tips, everything I got in my back pocket. So when he does get in there, he can protect my guy [quarterback Derek Carr] like I do. Because at the end of the day, me and DC are always going to be friends." Last month, Miller signed a four-year contract that included a team option for a fifth year with the Raiders. The 6-foot-8, 310-pound Miller started 23 of 31 games with UCLA, playing both tackle spots. He is expected to play right tackle with Oakland. Miller started all 13 games at left tackle as a junior in 2017, protecting the blind side of former UCLA quarterback Josh Rosen, who went to the Arizona Cardinals with the No. 10 overall pick after they moved up five spots in a trade with the Raiders. Parker, who signed a four-year deal, was named the MEAC Conference offensive lineman of the year three times at North Carolina A&T and enhanced his stock with a solid showing at the Senior Bowl in January. He made all of his 48 starts at left tackle and was a three-time FCS All-American at left tackle.